Having your first baby changes life in countless ways. Suddenly, you go from sleeping soundly each night to waking at the tiniest peep from the nursery. Cash flies out of your pocket at record speed to pay for diapers and doctor’s appointments. And free time … What’s that? Anticipating baby’s arrival may even make parents-to-be reconsider the family pet. How will Fido get along with your bundle of joy or will there be issues? 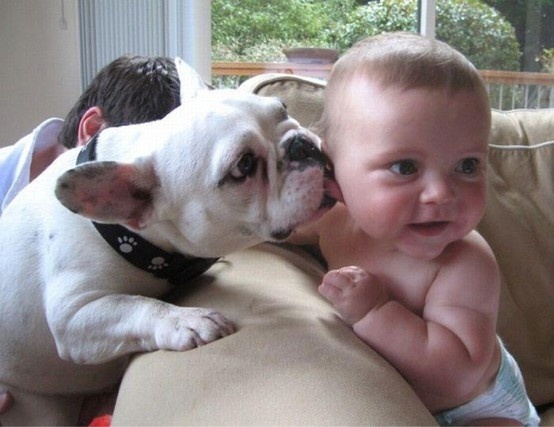 A new study shows furry friends actually may benefit baby. Researchers writing in the journal Clinical and Experimental Allergy say living with a dog or cat indoors during the first year of life can significantly reduce a kid’s chances of becoming allergic to these animals during childhood. The researchers studied nearly 600 children from birth. Based on information provided by the tots and their parents, the scientists concluded that boys who lived with a dog at home in the first year of life were about half as likely to be allergic to dogs at 18. The same held true for babies of either gender born by C-section. Eighteen-year-olds who lived with indoor cats in infancy were less likely to be allergic to felines. The investigators said it’s unclear why some groups were affected more significantly than others by living with dogs, or why cats seemed to provide greater protection against future allergies. But they did offer a theory on why pets may lessen a child’s propensity for animal allergies. Indoor pets increase the variety of microorganisms in the home. Exposure to a variety of germs at an early age seems to prime the immune system to cope better with many materials throughout life. But sheltered immune systems can react negatively to unfamiliar microbes. So you can breathe a sigh of relief, pet owners. As long as your fluffy friends have kid- compatible temperaments, they may help, not harm, your baby. A couple of years ago, we went to an allergy specialist, and saw an Israeli peanut treat hanging on his wall. I asked him about it, and he explained that the country with the fewest peanut allergies was Israel, because all toddlers ate that peanut treat (I definitely did when I was a kid in Israel). It’s the same thing. Parents are so afraid of allergies, that they end up creating more problems. BloggerFather, thanks for the response and I totally agree. Babies should be exposed to things early. It helps the body identify and learn to fight what ever it is. Same could be said with flu shots which always have a small amount of the flu virus in it.